When video is playing, I can't cover a part of video with a different window. Video playback overlaps my current window, although it's not active. 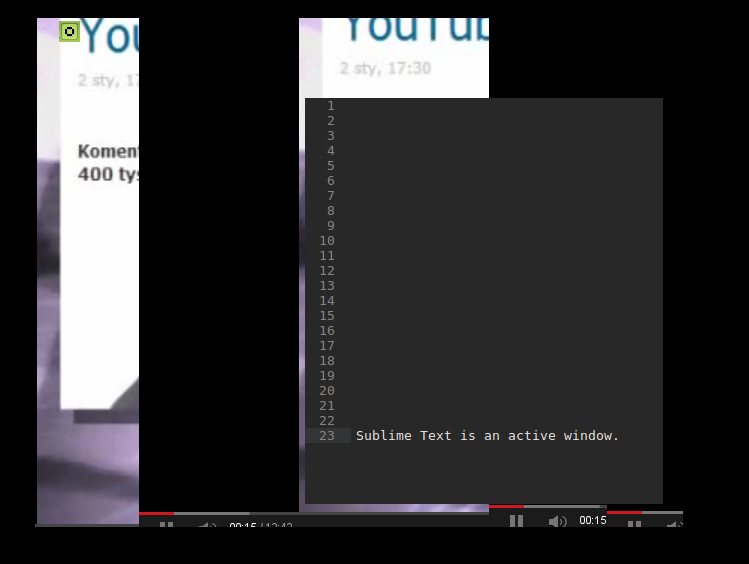 Video playback doesn't overlap the video if a different window totally covers it. After I move an overlapped window away from the video playback, it doesn't refresh. I have to move the window outside the screen and back to get it refreshed. Using x86_64 Arch Linux 3.9.6-1-ARCH, radeon and glamor from git, KDE. Please attach your xorg log and dmesg. Are you using flash and if so, is this just an issue with flash or does it happen with other movie players? Good catch Alex. Playing WMV and AVI (xvid) in mplayer is not affected. So yep, this is probably Flash. I also recalled that a similar thing happens in IntelliJ IDEA, a Java IDE. In the picture you see a small active window overlapped by the main window. This doesn't happen that often but maybe it's caused by the same thing (video redraws 50 times a second, IDE not that often?). Steam for Linux is affected by overlapping as well. > (video redraws 50 times a second, IDE not that often?). Actually, I think that's rather unlikely. I haven't been able to reproduce either problem. Please provide more detailed instructions, e.g. any configuration details and explicit steps to reproduce the problems. That's everything I made regarding the configuration. And since I use Arch Linux, I don't have any distro-specific configs like in Ubuntu. There are no explicit steps to reproduce. It happened every time. What card and OS did you use? Thank you Michel for your reply. > That's everything I made regarding the configuration. I was rather thinking of the configuration of the desktop environment and apps. > There are no explicit steps to reproduce. It happened every time. At least for the IntelliJ problem, please explain in detail the steps you took to create the problem shown on the attached screenshot. > to create the problem shown on the attached screenshot. Any "popup" window that appears *may* be overlapped by the main window. It can be a rename refactoring (Shift+F6), evaluate expression (Alt+F8 during debug) or inspection menu (Alt+Enter on highlighted code). Since this happens randomly I can't provide any explicit steps. But it happens constantly during the work. I won't be able to do it know. My 7870 burned two weeks ago and I'm now waiting for a new one. > Good catch Alex. 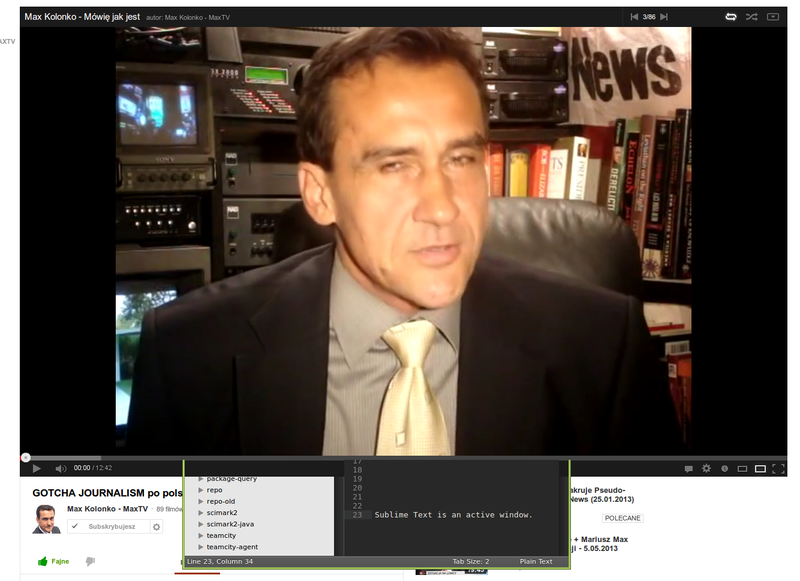 Playing WMV and AVI (xvid) in mplayer is not affected. > So yep, this is probably Flash. Flash video doesn't overlap the windows any more. > Steam for Linux is affected by overlapping as well. Steam STILL overlaps other windows. > I also recalled that a similar thing happens in IntelliJ IDEA, a Java IDE. > redraws 50 times a second, IDE not that often?). This needs a day of work with the IDE, it can't be reproduced ad hoc. Since Steam is still affected, I'd guess this does not work as well. I will follow you suggestion and will try updating the kernel to 3.11-rc4 and mesa to git. > Steam STILL overlaps other windows. Note that Steam is a 32-bit app. Check (e.g. by running it with the environment variable LIBGL_DEBUG=verbose) that it's using direct rendering, and that the radeonsi_dri.so it picks up is from up-to-date Mesa as well. 3.11-rc6 changed nothing. mesa-git and lib32-mesa-git did. Thank you Michel. I noticed the same issue as described in first comment, updating mesa and other components doesn't help. For me it doesn't happen with flash though (probably because this case was fixed). 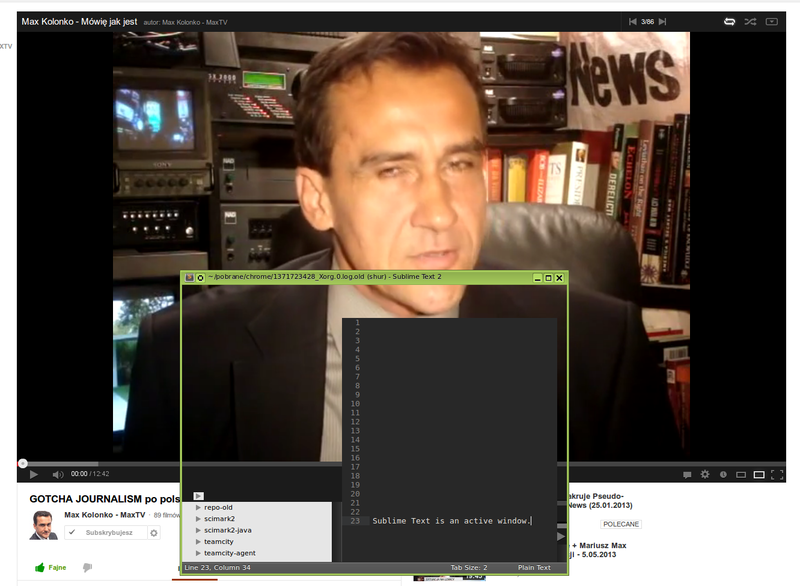 I noticed it with mythtv frontend, but also it can be reproduced with "mplayer -vo sdl" (and vlc with SDL output). It's reproducible only when compositing is disabled (Fedora 19, XFCE). This patch fixes it for me. Fixed for me too, thanks. Confirming. Although I first thoguht latest mesa and kernel resolved the issue, it still appeared from time to time. This fix resolves the issue for good. Thank you.